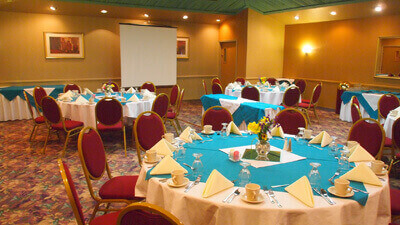 Are you looking for that ideal location to host your next meeting or conference? InnSuites Hotels & Suites offers a wide variety of spaces ranging from 250 square feet all the way up to 14,000 square feet. Our meeting facilities can accommodate group sizes from 5 – 1,500 people and our team of planning professionals is dedicated to making your banquet, conference, meeting, party or wedding everything you envision! When it comes to selecting your menu, we take great care in making sure that your event is a huge success. Should you have special needs, our team will be happy to tailor a menu around your specific requirements. The InnSuites Hotels & Suites offers free High Speed Internet access and Audio Visual Equipment is available for your use. Enjoy the Business Center with free High Speed internet access plus limited fax and copy service, free local phone calls and other business support services. Plus, check out all the InnSuites amenities that you and your guests will love to take advantage of! In addition to the InnSuites Hotels’ Meeting Rooms, enjoy the spacious Lobby, Patio, Courtyards and Pool area for getting your group to enjoy the great weather with breakout sessions, coffee breaks or outdoor lunch. Do you need to ship materials prior to your arrival? Simply contact the hotel to arrange for optimal shipping instructions. We suggest: UPS, FedEx, United States Postal Service. For each InnSuites Hotels’ Meeting Room specifications, please contact the Sales or General Manager directly.